Football fans need to head straight over to Coral Casino as once again it is time to make sure you receive your free casino bonus. 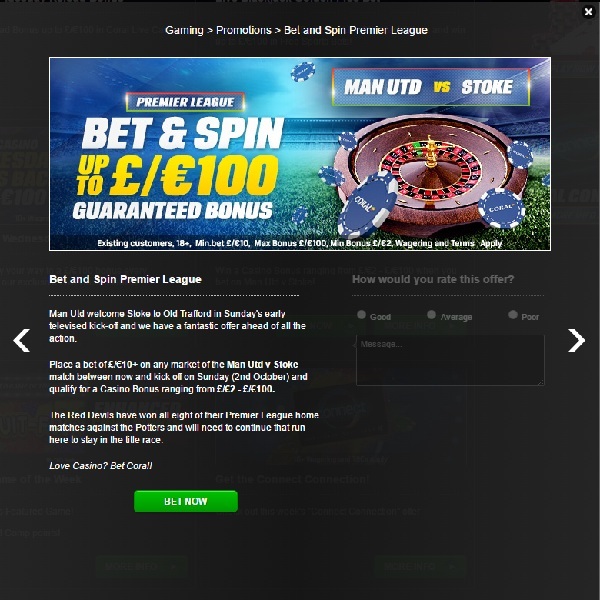 All you have to do is place a bet of at least £10 on any market of the Manchester United vs Stoke City match taking place this Sunday and you will qualify for a guaranteed casino bonus ranging from £2 up to a massive £100. This means that you are sure to have some extra funds with which to enjoy Coral Casino’s great games next week while you wait for the next football match. Of course if you win your bet as well you’ll be rolling in it and can definitely get your week off to a good start. Head over to Coral and place your bet today to guarantee your bonus for next week.